This season is my 22nd year as a Professional Fishing Guide. It seems like only yesterday when I swapped my regular job, collar and tie for a fly rod, fishing boat and the best office in the Northern hemisphere; Chew Valley Lake in the beautiful Mendip Hills area of Somerset. I have been fishing since the age of 6 when my brother made me my first rod using a simple bamboo cane. I was besotted with eels, then roach, tench, pike and bream, but once I found fly fishing, I simply couldn’t stop! Now I run my Guiding business primarily on Chew Valley and Blagdon Lakes. 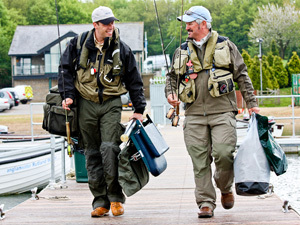 These are without doubt two of the best fly fishing venues in the UK. 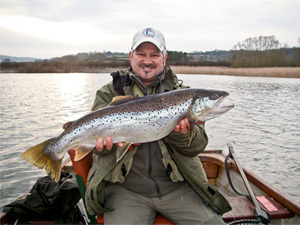 The quality of the rainbow and brown trout is sensational, due in a big way to the huge variety of aquatic insect life, providing rich pickings in these fertile lowland reservoirs. 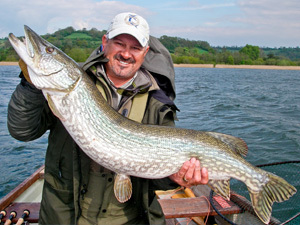 Pike are also a prized commodity on Chew Valley Lake, with 20lb specimens now commonplace. At specific times of the year, Bristol Water allow a restricted number of anglers to fish for the pike using artificial lures and saltwater deadbaits. Last Autumn saw a pike of over 43lbs taken on a dead bait and many feel that the new UK record will come from Chew Valley! Although I am happy to Guide anglers during these pike trials, it is targeting them with a fly rod that I find the most exciting and rewarding method! Competition fly fishing is my main driving force and representing England at International level is my passion. I am proud to have fished for my country more times than any other angler and am the only person ever to have been appointed Captain at World Championship, European Championship, Loch Style and River levels. Winning the 2009 World Championships with Hardy Greys Team England in Scotland was a dream come true. In the same year, I won the Individual Silver Medal at the European Championships held in Ireland and the following year added the Individual Bronze Medal at the World Championships held on the River San in Poland. This year, I won a World Team Bronze Medal for England in the Czech Republic World Championships and topped off a fantastic season by becoming the 2014 National Loch Style Champion in the first ever 2 Day National Final fished by 120 anglers at mighty Rutland Water. I am very fortunate to travel the World fishing and have caught some truly awesome fish. Yet on these adventures, I have also witnessed some spectacular scenery and wonderful wildlife. 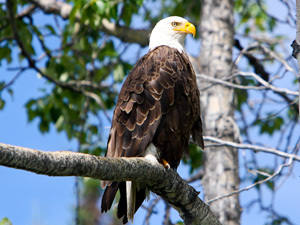 Bald Eagles, Moose and Loons are almost commonplace in the Yukon, while Dolphin, Flying Fish and Sailfish follow the boats in the Maldives. However, we also see some pretty spectacular sights back home on the Bristol Waters - Ospreys, Peregrine Falcons and Hobbies are frequent visitors, as are an abundance of other wildlife that flock to these important semi-natural habitats. During November and December last year, our new TV Series "Chris Tarrant Goes Fishing" was shown on C5 and was watched by some 2 million viewers! I was co-presenter with Chris and we had a great time filming in fantastic locations and catching some incredible fish. If you missed any episodes, C5 will be repeating the series in the near future - just keep an eye on my blog to find out when it will appear on TV.